If you want a competitive edge, then make and sell your own craft beers. If don't have a lot of space and don't want to spend a fortune upfront, then this is the system for you. 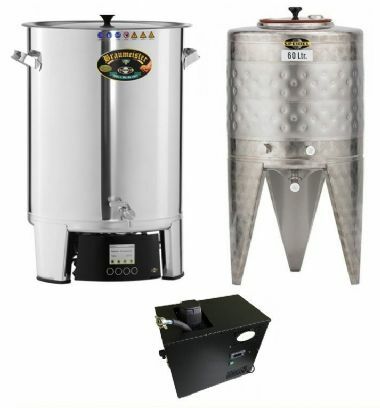 Its every bit as good as the larger Speidel microbreweries, looks fantastic, and comes with full temperature control chillers etc. Its just smaller: it will fit on about 4 feet of kitchen counter. It makes over 50 litres any type of beer including lagers, pilsners, stouts, ales and any other type of beer you can think of. Its dead easy to use, you can train bar staff in a day to use it. Its computer controlled so it takes care of nearly everything with minimum input from you. And it makes consistent beers that your customers will cherish. Step 1: Book yourself on one of our courses: Setting Up A Small Brewery 1 Day Courses. These courses include a brewing demontstration of a 200 litre system, and show you how to quickly get around all the paperwork and regulations required to set up a small brewery. Kegs are not included in this product as you probably already have them. Kegging and bottling are discussed on the course. Step 2: Get this system and start brewing. We can supply you with all the ingredients to develop your own recipes in "pack" form so that you don't have to store grain etc. Or we can help you develop recipes. We also offer all the existing Speidel recipe "packs". Step 3: Get the paperwork in order. This can take about 6 months (if you attend the course) or maybe years if you go it alone from scratch,. Step 4: Start selling your own great craft beer, and give yourself a real competitive edge. Step 5: If all goes to plan you will soon want to upgrade to a larger system. When you buy this system, you automatically qualify for a 1000 euro discount on the larger 200 / 500 litre systems. And then you can still use this system for "seasonal" beers, and other lower volume brews. And further recipe development of course.